Approx 19 1/2" long, pendant 2 1/2" x 1 1/2"
This necklace is made with a beautiful piece of carved jade that is wrapped in 18k gold vermeil. 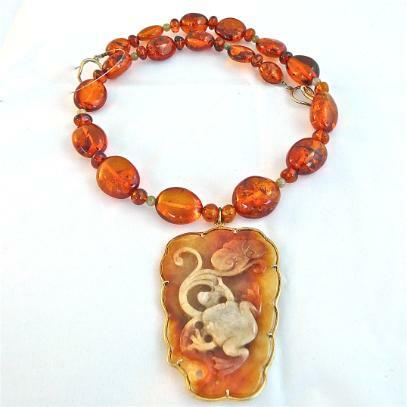 The reddish orange jade with golden highlights is carved with a raised frog and a lotus. 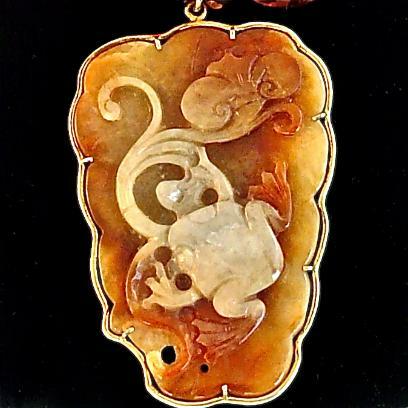 The artist has used the variation in the color of jade to carve the frog out of the lighter part of the jade so it really stands out. 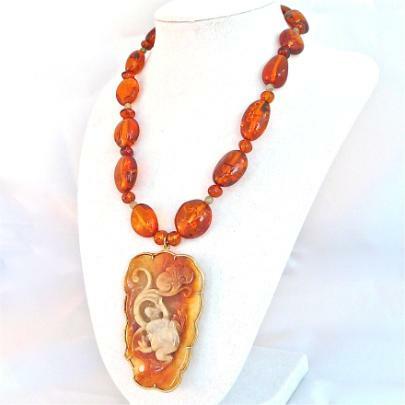 The oval Baltic amber beads are a perfect complement. 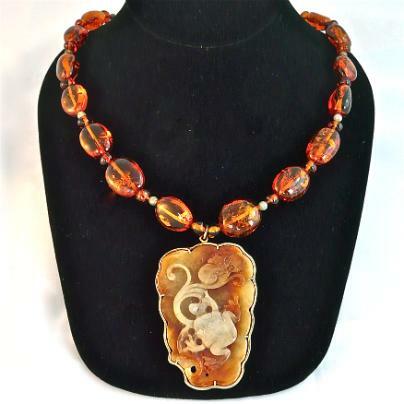 In between the Baltic amber beads are some smaller amber beads and some jade beds the same color as the frog. 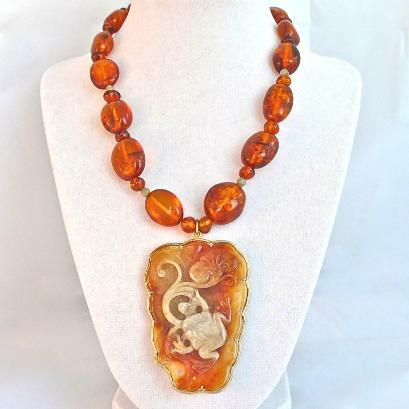 The one-of-a-kind necklace is a very dramatic necklace. The frog, or heavenly chicken, is symbolic of happiness, good luck, longevity and prosperity. The frog is believed to promote pleasant dreams. It is symbolic of spring and abundant rain, as well as prosperity, happiness, good luck and fertility. The lotus, sometimes called the sea rose, is a symbol of purity, fruitfulness and creativity. Worn by Imperial families for centuries, jade is a very spiritual stone. It has been called the jewel of heaven, the stone of immortality, a symbol of purity and is believed to embody the five cardinal virtues: charity, modesty, courage, justice and wisdom. From cloudy white to golden brown, light to dark green, to rare lavender, this is the most highly prized Asian stone. Jade is treasured for its magical powers and is believed to increase life span, cure all ailments and ward off evil spirits. Jade has been regarded as the most precious stone for thousands of years. It is believed to protect the wearer and ensure good luck and good health.